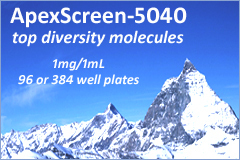 ApexScreen is a collection of 5,040 compounds that were selected to represent the diversity of TimTec stock of over 160,000 compounds in a smaller format as opposed to larger general screening collections. ApexScreen in a variety of formatting options tailored to customer requirements is a collection that allows You to jump-start any screening project. ApexScreen was created by using TimTec's Diversity Analysis Software, that allows the assembly of libraries with maximized chemical diversity from databases of compounds that are currently available from TimTec US and/or overseas stock. Diversity libraries can be further filtered to include molecules that fall within designated MW, cLogP and Lipinski Rule parameters. 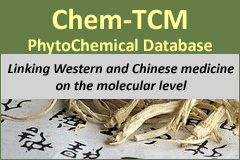 TimTec can also provide a selection of compounds from its databases which will include only those compounds that will contribute to the diversity of an existing customer library. 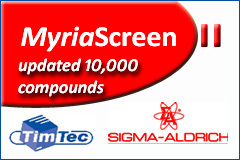 In addition to diverse selection of compounds that represent variety of chemotypes in TimTec general stock collection, ApexScreen includes a number of pure natural compounds from TimTec Natural Product Library to suit current trends in screening. ApexScreen is a perfect collection for starting any screening project and a valuable addition to any existing compound library. Various formatting option in terms of sample size or concentration are available.